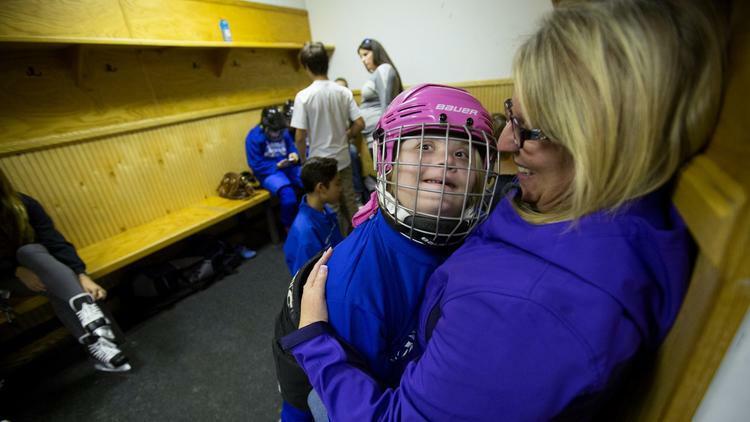 When asking Isaiah Granet how he came up with the idea to start the San Diego Chill hockey team for kids with special needs, he cites just how much hockey has helped him in his life. The 15-year-old originally started the team as a project for his Bar Mitzvah, but after seeing how much it meant to the players, he did everything humanly possible to keep the program going. The team is designed especially for develomentally disabled children ages 7-13. Every Sunday, they practice at UTC for free. "Each player who comes here has an individual coach", says Granet. "It's really amazing to see the way the players improve when they have individual attention, but it can be hard to get enough funding to make sure everyone can get on the ice." Currently, one year of Isaiah's program costs $14,000 dollars. It wasn't easy to set up such an amazing program. Granet had to find lawyers and business owners to help him out, and even after he did only two players showed up to his first practice. Even though the turnout wasn't what he had hoped for, he knew he had to keep going. After seeing the way hockey affected these kids he said, "it was the greatest thing I've ever seen. We don't charge players for anything. Jerseys, Ice time, and coaches are all on a donation or volunteer basis", says Granet. "The effect Isaiah has had on so many families is unbelievable," said Lisa Olson, the mother of one of the San Diego Chill teammates. "I think sometimes the parents forget that he's 14, because I just can't imagine somebody at that age wanting to do something like this for people he doesn't even know." "The most memorable moment of any game, for me at least, is seeing a player gain confidence, seeing someone do something they thought they couldn't do", says Granet. "It's always shocking to see just how far a player can come." "Everytime a player shows up who can't skate the first time, or gets frustrated, or is reluctant to go on the ice, I worry. But then they keep coming back, they keep pushing, and the day when they finally reach that goal, the day they skate on the ice and smile and cheer, that's always the best part, every time." The San Diego Chill is the recipient of the $1000 Get In The Game team grant. FlipGive and HockeyShot.com are so honored to be able to help keep this amazing team going.